As soon as you mention ABS I think "shrinkage"! Have you tried printing the part in another material just as a test? Do you have the door closed and latched on your Robox or just down enough to clear the interlock? In my experience ABS is very sensitive to draughts and the warmer you can keep the build chamber the better. @aftconsult if you can share the model or the printjob folder it might help figure it out. Share via the support portal if it is a private model. I have made a support ticket so they can check the model as well. It might not be that but it looks similar to problems I've had with ABS in the past. I've had very good results with ColorFabb nGen PETG. Ive got a couple of reels of HDglass too but I haven't tried it yet. I have no reason to believe it won't be just as good. I think you are more likely to get shrinkage problems with higher fill densities as the outer surfaces will cool down more quickly than the fill material. In my experience, fill densities over about 80% are more trouble than they're worth. Just a thought... Have you got the part orientation such that the face shown in your photo is to the front of the Robox? It might be less prone to surface cooling (and z axis shrinkage) if the outer face is to the back of the build chamber. Sounds daft but it may be worth a try! A little trick to get strong parts without using 100% fill is to add more perimeters. If you set perimeters to 10 your part will be pretty much solid in any areas where the total width is less than 20 perimeters. This will allow you to then use a lower fill % for the less critical parts, faster prints with less material. This looks like a filament feed issue to me as there is no other indication of warping visible in the picture. It looks like there is a perimeter that isn't getting deposited. This could be due to a filament issue or a head issue. 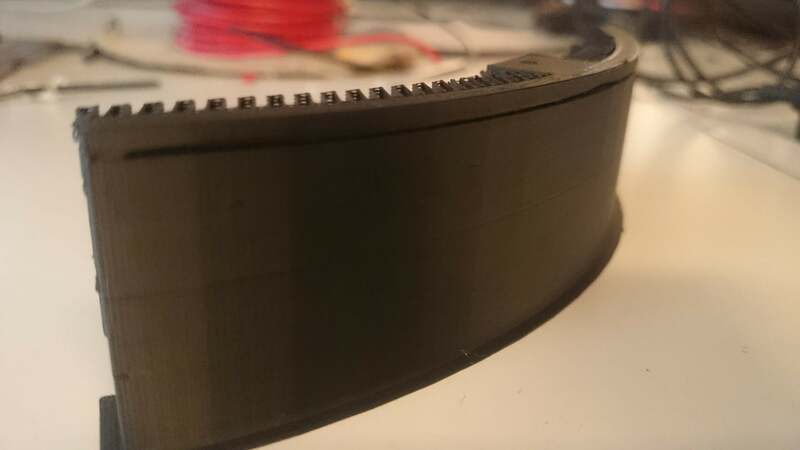 Make sure your filament isn't tangled and that your head is purged regularly. The same thing happened to a print job of mine that ended this morning. Ran for ~38 hours. Everything looked good until about 15 hours left. Came back in the morning and had the weird gap in all the tall parts all at the same level. 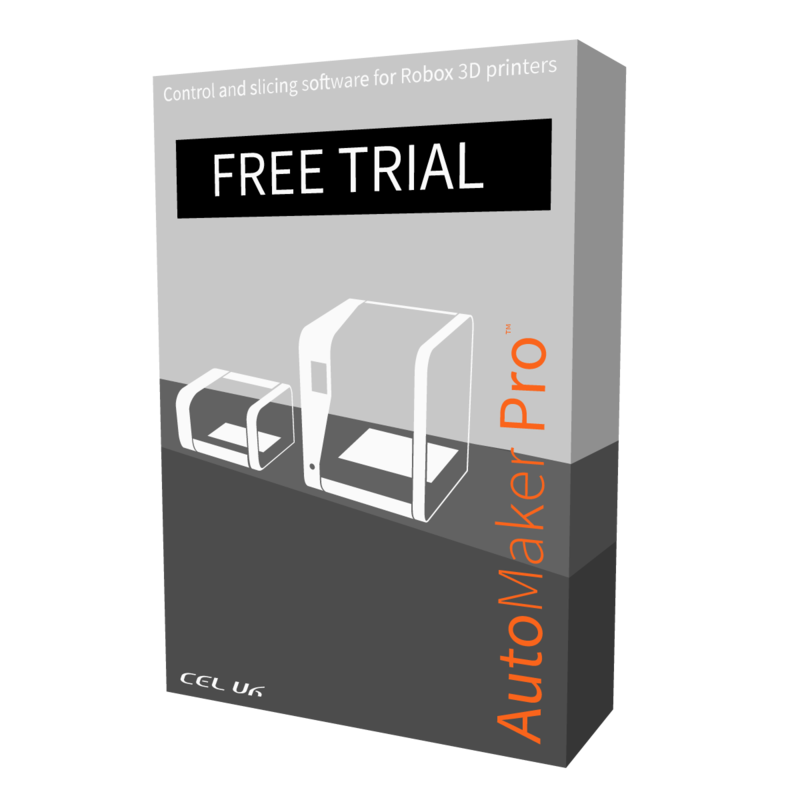 RoboxPro. Brand new CEL reel of PETG with CarbonFill. Third print job with SingleX head. 55% fill density, 1 Brim, Support, Support Gap, and middle resolution setting. Two of the parts were previously printed in PLA with no problems. @tewing new accounts can't add uploads but after a few posts it gets unlocked. You can also use the support portal link in my signature for assistance. I think based on the differences (RoboxPro, SingleX head, and CF-PETG) that I should have opened a new thread instead of jumping in on this one. But in case it helps, I opened a support ticket, and Ben Hudson says [abbreviated version], "... points to a material flow issue." My tests of the same parts in PLA (QuickFill head) turn out good, so maybe just inconsistent filament leading to material flow issues and related adhesion and low force shear line on the parts? Again, I missed that [OP] Chris was using Titan ABS and that he has had repeated problems with the same part. I was too keen on finding something similar to my issue that they might not be related--sorry to jump in.